Double Olympic Gold Medallist Sarah Ayton OBE, has been announced as an Ambassador to UKSA. 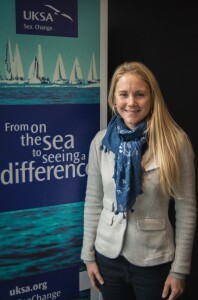 Sarah, winner of Gold medals in Athens and Beijing, is currently competing in the Extreme Sailing Series onboard Oman Sail. UKSA believe Sarah can bring her elite sporting background and interests in education and today’s youth development to UKSA’s pupils and young people. UKSA believe in harnessing the power of the sea to make a positive change.